The MRR-3D NG (“Next Generation”) is an operating in G-Band Multifunction Rotating Electronically Scanned Radar system designed for 3D air and 2D surface surveillance and self-defence, target detection and tracking. 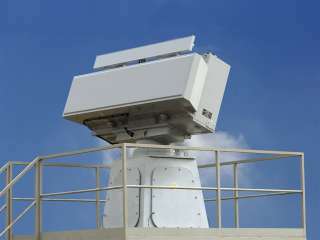 The antenna is electronically scanning in elevation to provide target designation (bearing, elevation, range, radial speed) up to an elevation angle of 70°. It performs automatic helicopter detection and classification, including pop-up and stationary helicopter over ground.